Guaranteed Auto Service has been providing quality car care in Newport News, VA since 1981. We have ASE-certified technicians, certified Virginia state inspectors, and we are the only certified ASE Blue Seal shop in the Newport News area. As a family business competing with dealerships and franchise auto service centers, we dedicate ourselves to keeping up with today’s latest automotive technology, so we can best serve our customers. And speaking of customers, customer service is a major reason why Newport News drivers count on us for auto repairs and maintenance. We take the time to explain what vehicles need and why we suggest the services we do. We at Guaranteed Auto Service open our doors each day with the understanding that your vehicle is a major investment, which is why we care for each customer’s vehicle as if it were our own. Because Guaranteed Auto Service is a certified NAPA Auto Care Center, we can provide the benefits of an established national program—such as a nationwide warranty—while maintaining the personal touch of a family-owned and operated business. NAPA Auto Care is not a franchise, but a high standard in the automotive industry developed by NAPA decades ago. 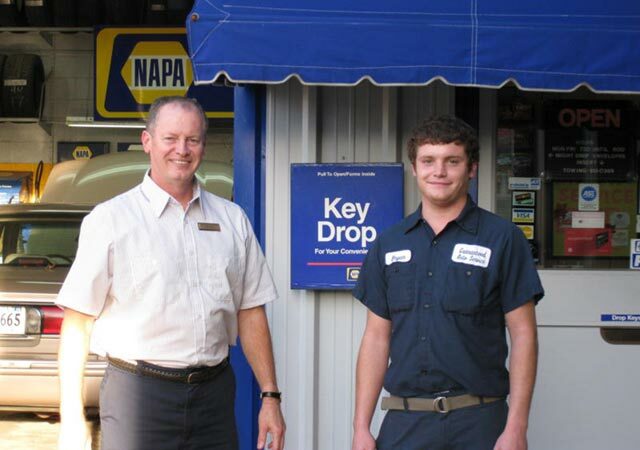 Because we meet or exceed NAPA’s high standards—and have an outstanding reputation in the Newport News community—we can offer exclusive benefits, like the NAPA Auto Care Peace of Mind Warranty, to our customers. Paul has been an ASE-certified auto repair technician for over 30 years, and he has 44 years of experience in the automotive industry. He opened Guaranteed Auto Service because of a desire to help others, and he simply loves working on cars. Isaac has now joined him in running the shop and carrying forward the Guaranteed Auto Service mission of providing high-quality service at a fair price. Chuck has been with Guaranteed Auto Service for many years, serving as our office manager and group administrator. He has always loved numbers and has over 20 years of inventory management experience. Chuck also handles our accounts payables, DMV processing, and group health coverage. Taz is a certified Virginia State Inspector and ASE-certified auto repair technician with over 40 years of experience in the automotive industry. He was been with Guaranteed Auto Service for over 25 years. Sam is also a certified Virginia State Inspector and ASE-certified auto repair technician. He has over 25 years of experience in automotive service. Kent is an ASE-certified auto repair technician with over 15 years of automotive service experience. Our auto repair technician, Leonard, has over 40 years of experience in the automotive industry.